Experts from the technical and decorative sectors provide insight on what to expect in 2018. From the needs of autonomous vehicles to increasing standards for plastics with antimicrobial properties, here are five areas to watch. Paul Uglum, chair of the Decorating and Assembly Division of the Society of Plastics Engineers and technical fellow for Aptiv, provided his thoughts on various design trends that will emerge or stay relevant. Uglum noted that original equipment manufacturers (OEMs) are pursuing a variety of appearance trends to establish unique market positions, but said ? no matter the OEM ? the overall vehicle architecture will drive the interior decoration that goes with it. ?There is a desire to move away from the flat panels or glasses that are used for various displays within an auto interior, such as sound systems,? said Uglum. ?We?re seeing displays with higher resolution or more color, but we?re also seeing a strong movement toward curved or more complex surfaces.? European OEMs are all leading examples of vehicle interiors containing a large panel across the interior, which are not all flat, glass substrates. Mary Ellen Rosenberger, founder and managing partner of BaySpring Solutions, LLC, added that touchscreens, a mainstay in today?s vehicles, need to be fingerprint-proof to improve vision. Transparencies, including the windshield, also need a weight reduction to meet lightweighting standards common across the transportation sector. Replacements for glass may take a page out of the aerospace industry, with more robust acrylics, polycarbonates and lightweight glass sandwiches. Trends also show movement toward more in-mold labeling and in-mold decoration to create complex surfaces for the displays and surround. ?When you?re putting a window into a plastic surface, you then can do some decoration to the area that surrounds it,? said Uglum. Real wood grain and fake wood grain continue to be in demand, thanks ? in part ? to improvements in the quality and durability of the wood grain appearance for wear resistance and long-term cleanability. The high-gloss black finish known as Piano Black remains popular. ?There are a number of ways of achieving it, and the durability standards have improved,? Uglum explained. Also benefitting from more aggressive wear resistance standards are UV-cured or dual-cured coatings for scratch resistance, which have seen an increase in use in vehicle interiors. Contrasting high and low gloss is a newer design trend used in some products. ?The buttons will be low gloss and the trim will be high gloss, so the interior has a good contrast and a very nice finish to it,? said Uglum. He noted an increase in specifications driving toward a more durable low gloss, since low gloss carries with it an increased risk of surface mar. Autonomous vehicles have made substantial headway as the self-driving ?computer on wheels? version of the future vehicle, offering fuel economy with improved safety options, according to Rosenberger. ?To deliver on reduced greenhouse gas (GHG) emissions, the entire vehicle design is advancing the use of new materials and new manufacturing methods,? said Rosenberger. ?Most notably, vehicles are built with a multi-substrate mix (steel, plastic, aluminum, composite, et cetera) that requires a different approach to material choice and assembly methods.? ?New low-cure paint systems not only allow for the use of heat-sensitive plastics but greatly advance the GHG reduction in auto factories by reducing heat demands of high-bake ovens,? she continued. ?Paint materials and process in the form of reduced-cure Ecoat (corrosion layer); two-component, 80°C cure paints or UV/EB light-cure paints; sealers and adhesives are approaches that are compatible with the goal of GHG reduction. In some cases, pre-painted parts are joined or built as a part of the final assembly process, eliminating the need for assembly paint shops. New methods of bonding parts will see the rise in the use of sealers and adhesives that minimize traditional welding and make vehicles quieter.? Rosenberger added that self-driving vehicles have a need for additional cameras with lenses that are self-cleaning and paint that does not absorb IR light but is more reflective for LIDAR sensors. ?Paint formulations are taking on a new set of design criteria to maximize the autonomous vehicle design,? she said. Uglum agreed, noting that it is important for autonomous vehicles to be able to sense what is around them with the use of LIDAR sensors. He explained that LIDAR sensors must be able to be hidden but also able to see through the paints and surface coatings so that vehicle aesthetics do not interfere with the sensing system. ?That?s a driver both for technology and for decoration because not every pigment system, not every stack of coatings, is going to be able to get the same transparency, and we want very reliable systems obviously,? said Uglum. ?Also, consumers want pleasing aesthetics, so we need to be able to hide the sensors and cameras, so that?s one area we continue to evaluate.? Rosenberger pointed out that with increased ride-sharing to reduce traffic and improve emissions, particularly in global urban areas, new demands are emerging for products with antimicrobial properties in high-use vehicles. Uglum agreed, highlighting that the new health risks entering the markets are driving increased durability standards, especially in North America. ?Mosquito and insect repellants are of increasing importance because of the attention viruses like Zika have received,? said Uglum. ?As consumers use more repellents, especially DEET, the risk of damage to decorated plastic increases. This will lead to the need for more durable coatings.? Due to destructive additives contained in hand and body products, demands are emerging to make vehicle coatings more durable. Previous specifications defended against the pervasive use of hand creams, sunscreens and waterless cleaners. However, as additives evolve, the industry also will see evolving specifications to meet these new risks. Uglum also pointed to new specifications and testing for plastics to defend against air fresheners. ?Paints and plastics can be severely damaged by direct exposure to most air fresheners.? Many industries are studying the benefits of 3D printing and how the process can improve development time in the manufacturing of parts. For automotive groups, the benefits are seen more on the production side than the decorative side, although that could change. ?Part development time can be greatly reduced with the ability to 3D print, cutting out the age-old, laborious process of developing a mold for each desired iteration of a part. 3D printing is a breakthrough addition to the world of manufacturing. 3D parts are functional for most automotive development studies, but are lacking in real-world durability testing. As a result, a 3D-printed part can be used for fit and finish, as well as the mold for a future part, greatly reducing development time,? said Rosenberger. The long-term goal of manufacturing parts for a 200,000-per-year vehicle platform still requires materials that pass durability testing and 3D printers that are functional and cost-efficient. 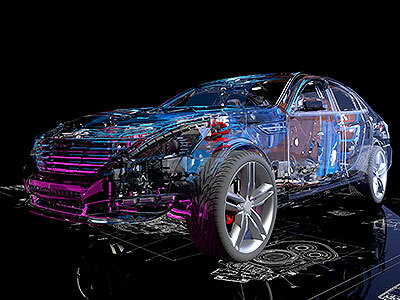 Work continues in a very serious way, as automotive OEMs and suppliers look at the technique as a strategic method to bring products to market quickly. Long term, the strategic advantage to 3D printing might be allowing niche segments in the automotive market to be developed and produced in a cost-efficient way. Uglum added that, to date, the 3D print quality has not been high enough to use in decorative parts, but rather structural. ?Will it be decorative?? he asked. ?I think it can get there. I just haven?t seen it yet.? As referenced earlier, automotive design is changing globally due to worldwide regulations aimed at the reduction of GHG emissions. Achieving a miles per gallon (MPG) average of 55 is the goal in the final phase of the US joint EPA/NHTSA 2018-2025 program. According to Rosenberger, Global Fuel Economy Initiatives enacted by Organization for Economic Co-operation and Development (OECD) countries have the goal of a 30 percent L/100km reduction by 2020, 50 percent reduction of all new cars by 2030 and 50 percent reduction of all cars by 2050. Programs to reduce GHG emissions continue despite the US withdrawing and renegotiating the Paris Climate Accord Treaty signed by 196 countries. The broad goal of the Paris agreement is the following: to strengthen the global response to the threat of climate change by keeping a global temperature rise this century well below 2 degrees Celsius above pre-industrial levels and to pursue efforts to limit the temperature increase even further to 1.5 degrees Celsius. Lightweighting of the vehicle, as an example, is one approach to improve fuel economy by replacing the primary material used (steel) with suitable lightweight alternatives, such as high-strength steel, aluminum, plastic and composites in every phase of vehicle and part construction. Fuel economy improves approximately six to eight percent by reducing vehicle weight 10 percent. Powertrain improvements to the standard combustion engine have dramatically improved fuel consumption over the last several years of development. Alternative powertrain development successes in hybrid and electric vehicles have made headway by becoming a viable approach for future vehicles, with some automakers announcing the elimination of the combustion engine in the next decades. Lightweighting is demanding that traditional industries, such as steel and aluminum, work very hard to find solutions to the MPG conundrum with lightweight offerings. On the other hand, the time is now for the plastics and composite market to make inroads. Steel still commands the lead in design, with approximately 35 percent of the vehicle weight, with aluminum 12 percent and plastic derivatives at 10 to 12 percent. There has been substantial movement in traditional exterior body panels to lighter-weight plastics and composites in vehicle design for bumpers, hoods and door panels. Carbon fiber is still too costly for low-cost, high-volume vehicle development but, with an excellent strength-to-weight ratio, is being researched to improve cost and manufacturing volume capability for the automotive industry. Cost vs. performance continues to be the main driver in the decision to move from a traditional metallic to plastic/composite on the exterior of the vehicle. In many cases, this has led to the ?multi-substrate? approach for vehicle design, which takes the best substrate for each purpose into consideration for the total design. Lightweighting solutions are needed for glass in windshields, side glass and panoramic roof glass. Aerospace leads the way in the development of transparencies, and this research will be borrowed from as much as possible for automotive design. Material solutions that are under development include laminates of polycarbonate, acrylic and new lightweight glass solutions. Interior parts are much more amenable to plastic solutions: Parts are smaller and the need for strength and durability is not as demanding. The interior of the vehicle includes solutions throughout the cockpit, seating, flooring and door panels with innovative materials made from an array of plastics. These five trends will impact decorating and assembly providers serving the automotive industry over the next five to 10 years. Assembly methods may need to change as new composites are created to meet lightweighting demands, and paint applicators need to meet the requirements of these new designs. Preparation is key for the future as these trends become standard fare for OEMs and consumers alike.